Following the second recent Flood on December 13th, we are fully open again from today. Indeed, Saturday 13th felt more like Friday 13th! It was due to see the final step in our phased reopening since the October flooding with the opening of our newly refurbished Devon Food Shop. This most recent flood brought fast flowing water through the carpark again, but this time only the craft shop in the gallery was flooded. We were able to dry it out over night with minimal damage and we prevented further flooding in the Bakery and Jewelery Studio through extensive sand bagging. Now that the water has retreated, we are reverting to our original reopening schedule. The temporary food shop in the carpark has served us well, but we are now delighted to be back in business with a new layout and style. We hope you will come and see us soon and help us make up for a lot of loss ground in the lead-up to Christmas. Otterton Mill Bakers Roy Hamilton and Peter Smith, having baked the first post flood bread for our retail partners who include B Natural in Exmouth, the East Budleigh Community Shop and Trumps of Sidmouth. "We are delighted to be back in business so quickly, especially as we've been told this was the worst flooding for at least 40 years" said Simon Spiller, who runs the mill with his wife Caroline. "Through the fantastic efforts of our staff and other partners we have been able to beat all the estimates on the time-frames for reopening" he added. "We were told by some experts that we would probably be closed until Christmas. But with some creativity and hard work we've been able come-up with a phased opening plan which should see most of the mill open by November 27th at the latest" said Caroline. The Spillers are delighted with the way the whole team at the mill have responded to the challenge of achieving a rapid reopening after all of their historic mill buildings were flooded to depths of up to two feet. "It has even felt like a team building activity for those of us involved in the clean-up" Caroline added. "We would also like to thank clean-up specialists, Munters, and local land owner Clinton Devon Estates for their very active support" she said. Since the mill restaurant will probably be closed for another week or two, the temporary shop will be serving a limited food-to-go menu, including: hot soups, baguette sandwiches and hot coffee. Everyone at the mill is looking forward to seeing their much missed customers once again! Some good news at last. Our Bakery and Devon Food Shop will be open tomorrow, November 12th, offering a limited service. 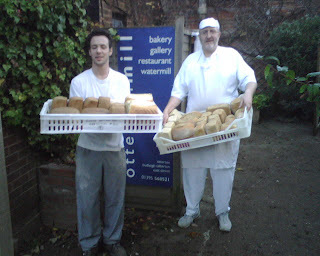 Bread will be delivered once again to our wholesale outlets and in our temporary food shop in the car park at the Mill. All other facilities will remain closed until further notice. We look forward to seeing you back at the Mill very soon. Many thanks to everyone who has offered support and enquired about our progress towards reopening. At the time of writing all buildings have been cleaned and sanitised, with fans and dehumidifiers installed to accelerate the drying process. Some buildings could take more than 3 weeks to dry and refit, others will be quicker as long as we have favourable weather conditions. Unfortunately, as we write, flood waters are again encroaching onto the car park and the sandbags have been re-installed. Please keep your fingers crossed for us. The temporary shop will carry a limited range of breads, sandwiches, soup to go, plus other treats and Christmas produce. As the owners of Otterton Mill we would like to express how touched and encouraged we are by the many expressions of support we have received from customers, suppliers, staff, volunteers and neighbour since the devastating flood of last week. We have been inundated with offers of help with the clean-up operation and we only wish we could take them all up. Due to the extensive nature of the flooding, most of the clean-up has to be conducted by a professional organisation, and that process has already started. Many people offering support have also enquired about our insurance and whether we are covered for flooding. At the time of writing we believe much of the cost associated with the clean-up and loss of business will indeed be covered, although we will loose some valuable preparation time for the important Christmas trade. Since taking over the mill last spring we have faced a very challenging trading environment with the credit crunch, poor summer weather and lower than normal tourist volumes. This latest incident initially felt like another major set-back. However, the support we've received has been a massive boost and we are now looking for ways to turn this disaster into an opportunity. For example, we've decided to launch a charity called Friends of Otterton Mill as soon as possible. This charity will hold funds to support the ongoing restoration of the historic mill workings. With the support of so many regular customers, we hope a Friends of Otterton Mill fund will help us keep the mill and regular milling demonstrations available to the public at no fee. We would especially like to thank the customer who posted a letter of support on the fence near the Mill entrance and we would like to assure that customer, and all others, that we are indeed looking to resume normal business as soon as possible .